On this page you will find: Introduction, Preparing for the iGEM Season, and the The iGEM Cycle. Starting an iGEM team and getting a project started can be a challenge even for returning teams. Below you'll find some highlighted items that teams should be working on before and during the iGEM season. It is our hope that this page will be helpful to all iGEM teams, whether this is your first time participating in iGEM or if you are returning as a seasoned veteran. If you have any suggestions for content or questions, please send an email to us at hq AT igem DOT org! Students and instructors who are interested in having an iGEM team for the upcoming season often begin preparing between November and February. Below are some helpful tips to get the process started for the 2019 season. Assess successes and failures, discuss interest in continuing next year, etc. This may be a challenge if you're a first-time team, but stay positive! Make sure to talk to numerous Professors in your Biology, Biomedical Engineering, and Engineering departments and gauge interest early. 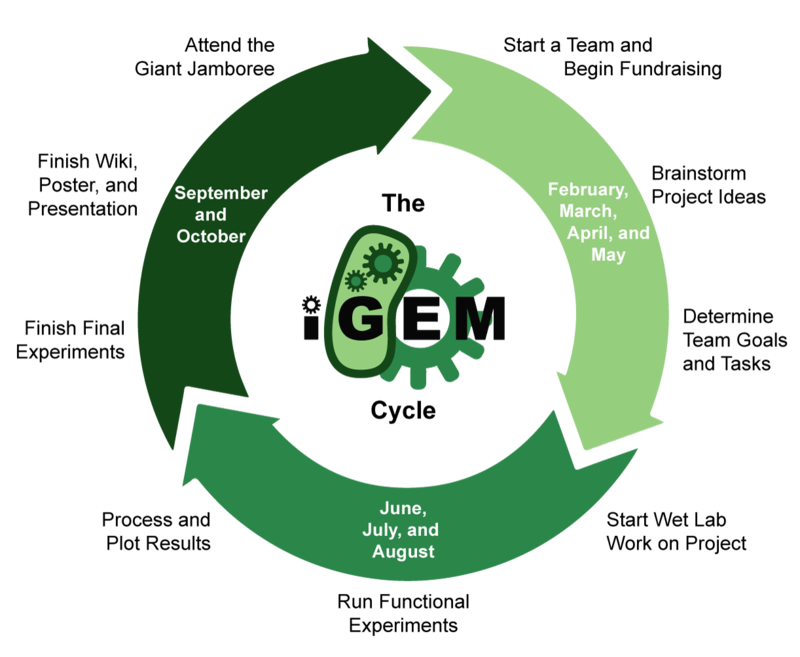 The iGEM competition cycle can be seen on the right. 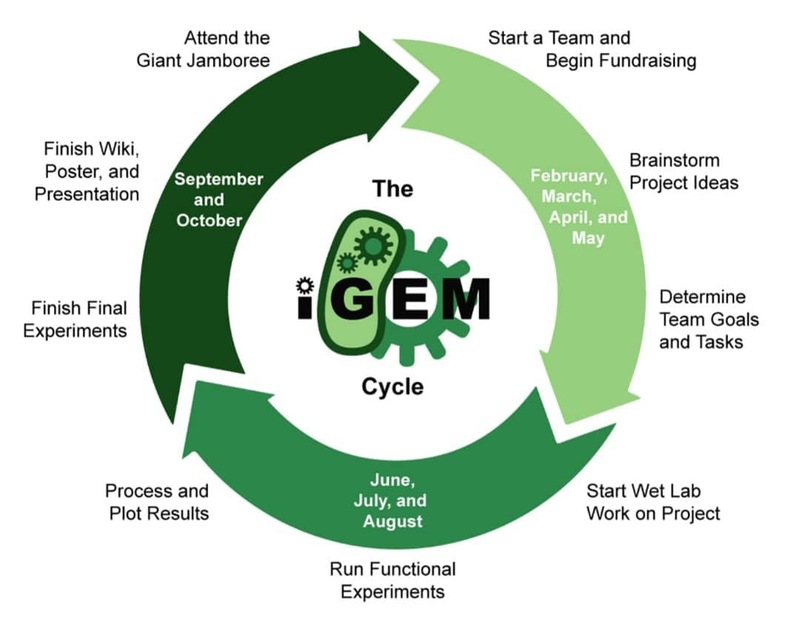 Not all teams follow this cycle (for example, you may start work earlier or later than this shows), but this is the general flow of the major tasks involved with participating in iGEM. This is based on the 2019 season, with the Giant Jamboree taking place in November. This can be done throughout the cloning process once you have a functional device. Test your device and collect your data. You should be continually working on your Team Wiki and Registry Part pages throughout the project. Don't wait until the last minute! Similar to your Team Wiki, you should try to work on the presentation throughout the project. Final touches should be done in September. Once you have your final data plotted and ready to show, you should make your poster and practice presenting it. Come to Boston, meet other iGEM teams, celebrate your work, and have fun!